Maybe I’m the last one to finally read Freakonomics, but in my defense it was the updated version. 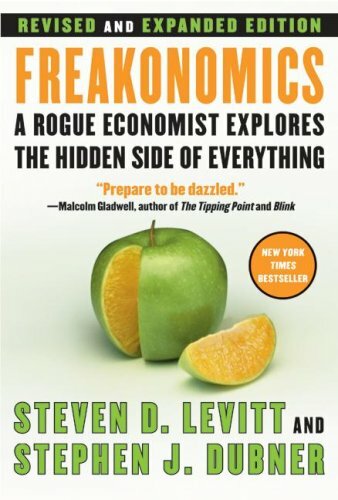 Freakonomics [Revised and Expanded]: A Rogue Economist Explores the Hidden Side of Everything by Steven D. Levitt is part fascinating and part tedious. The chapters dealing with crime are boring and make logical leaps that almost make you want to quit reading the book. However, I enjoyed the rest of the book. My favorite part was in the expanded section and went into detail on why voting is a waste of time. If you proudly wear your I Voted sticker on Election Day, this information may upset you. Couples that are debating having their own children or adopting, need to read Freakonomics. This book has covers some excellent information on nature versus nurture that should be discussed when planning a family. I love this book. It definitely is edu-tainment and should be taken with a grain of salt, but is so fun to read. Just finished another very similar book called Super Crunchers a couple of weeks ago. If you liked Freakonomics you’ll probably like Super Crunchers as well. The freakonomics blog is also very entertaining. I just added Super Crunchers to my reading list. Thanks for the tip.